The Community Blood Center’s Kathy Pleiman presented the 2016 Platinum LifeSaving Ambassadors Award to the Champaign County Commission. From left are Commissioner Steve Hess, Pleiman and Commissioners Bob Corbett and David Faulkner. 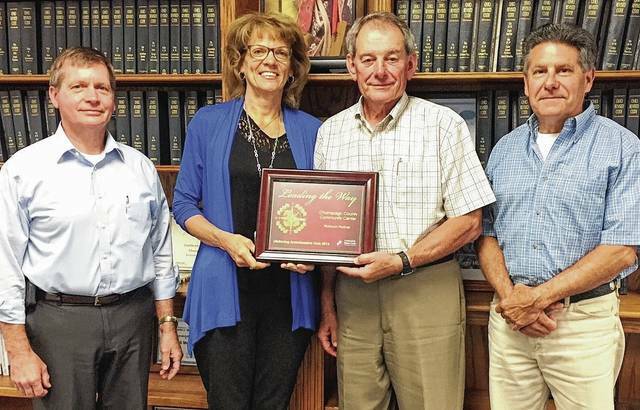 CBC recognized the county Community Center for earning the Platinum award for blood drive excellence in 2016, the highest recognition in the CBC LifeSaving Ambassadors Club. Sponsors must average 100 percent or higher for blood drive collection goals to achieve the honor. The county Community Center hosted six blood drives in 2016 resulting in 195 donor registrations and 166 blood donations.